Though I do not know for certain, I am working under the hypothesis that Martha Zenner Muenzel (1868-1960), pictured on the right, is my 1st cousin 4x removed. Martha was a 1st cousin of my 2nd great grandmother, Fannie Schmidt Ratz (1870-1944). 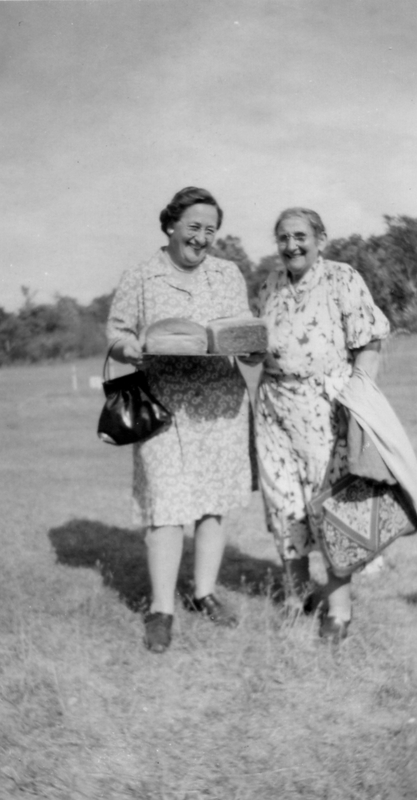 Standing next to Martha, holding two loaves of bread, is my great grandmother (Fannie's daughter), Alma Ratz Hanley (1894-1979). I believe this would make Alma and Martha 1st cousins 1x removed. As 1st cousins 4x removed that would mean that I share with Martha a set of grandparents. That is, Martha's grandparents (the same as Fannie's grandparents) are my 4th grandparents. Here is a chart depicting the relationship between Martha and Alma as I understand the information currently. Relationship between Martha Zenner and Alma Ratz, the two women in the photo above. As you can see the information is somewhat spotty. I am working on the documentation and I will keep you posted. "Mother [Alma Ratz Hanley], Martha Muenzel (related on Mother’s side). She lived in the little lumber town of Donken on the road past South Range. She was a widow and lived with her brother Albert (known to all of us as "Rabbit". A bachelor). Martha was a great favorite with Mother [Alma Ratz]. Martha had very thick eye glasses, leg problems and a very thick German accent. She was a kind, generous, smiling lady. We would always look forward to visiting her once every summer. If Martha would hear a car coming up the driveway, she would start peeling potatoes. She enjoyed feeding everyone that stopped by. The house was like a log cabin. She was a great cook and always sent some bread or Kuchen back to Atlantic Mine with us [Atlantic Mine, MI the town where my great grandfather, Alma's husband, lived]. Mother [Alma] is holding two loaves of Martha’s bread in the photo. I remember that I had to listen very carefully when she talked to understand her English (heavy German accent). "Rabbit" [Martha's brother] was very comical—always a joke or two I have very special memories of these visits. Dad [Michael John Hanley] took me down to see the sawmill. The men were on machines flipping the logs. They would have to judge how to place the tree logs to get the most boards from each tree. Dad was explaining what was going on to me." Here's a photo of Martha standing if front her house that Aunt Beverly remembered looking like a log cabin. 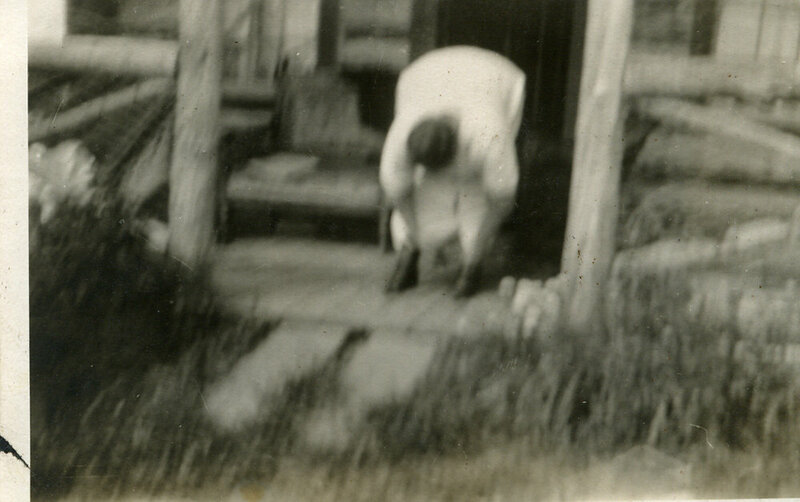 Though blurry, it seems to capture her spirit as she bends to tie her shoes. And here is the only photo I have seen of Martha's brother, Albert "Rabbit" Zenner. He is on the far right. Martha is in the center. Left to right: Mayme Hanley, Alma Ratz Hanley, Martha Zenner Muenzel, Peter McNamara, Albert "Rabbit" Zenner. Martha was obviously a well loved member of the entire community. An article was originally published in The Daily Mining Gazette in January of 1958 about Marth's 90th birthday. It was reprinted in the same paper several decades later (1993, seen here). I don't know much about Martha's Husband, Emil Muenzel (1866-1939). I have not found any evidence that they had any children. Clearly Martha was close with many in her extended family, including nieces, nephews, and cousins. Wickelkloese (or Wickelklöße) - a type of wrapped dumpling. You can try google translate to see how it is pronounced. With my eyes closed and a little imagination I can see Martha setting the table and smell some of her delicious treats. She is smiling. As I think about Martha and my family tree I am reminded of the mission of The Psychologenealogist: Exploring the spaces where psychology, genealogy, and history converge - one story at a time. Here are some of the questions I have about. Is the family tree I have correct for Martha? If my tree is incorrect, how then is Martha connected to my family? What did it mean for Martha, who was possibly childless, to be so close to her cousins, nieces, and nephews? Did Martha miss her native land of Germany? Food was obviously important to her. What did it mean to her family for her to be such a special cook and person overall? This is the 15th of 52 weekly posts planned for 2018. It was inspired by the #52Ancestors writing challenge issued by professional genealogist, Amy Crow Johnson. The challenge: once a week, for all 52 weeks of the year, write about a relative in your family tree.